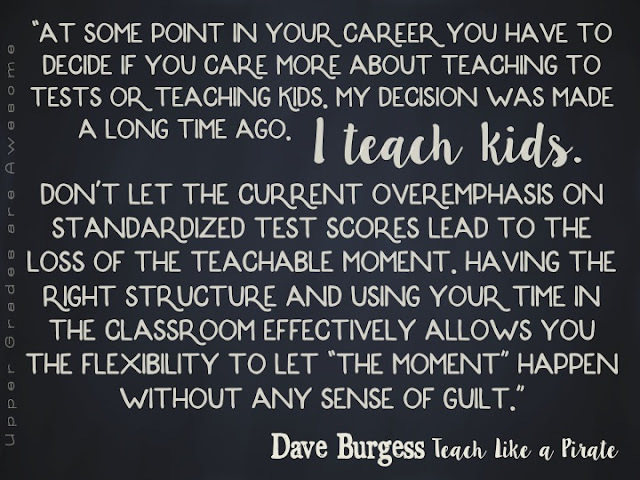 Reading "Teach Like a Pirate" by Dave Burgess was like meeting a kindred spirit...someone else out there who eloquently put my teaching philosophy into a book! Now, I am no where near as charismatic as Dave, but I found so much of how I approach teaching in this book. It was thoroughly refreshing! Dave does an excellent job of detailing his PIRATE philosophy in a fun and engaging read. Much of his philosophy I already practice, but there was something that Dave spends a lot of time on his book that I think will really be a game changer for me. I am a creative person and I love to come up with different ways to approach lessons to make them more fun, engaging, hands on, and meaningful. Unfortunately, as a teacher, we've been handed a daunting task and our energies are quickly zapped. The consequence seems to be that my brain is fried by the time I get to the lesson planning. Dave threw me a life vest, or perhaps even offered me a dingy, because in the book he provides amazing questions to help guide lesson planning and get that hook to make a great lesson the best lesson. It took some time, but I typed each out, printed the several pages, and put them in my lesson plan book, all ready for next year! Have you read Teach Like a Pirate? I'd love to hear your thoughts! Stay tuned, I'll be posting my thoughts on Learn Like a Pirate in my next post! Thank you so much!! I really appreciate you writing such kind words about #TLAP. Let me know how it goes this coming year...great idea to make the questions accessible for lesson planning.